St Paul's Church is in the centre of Rondebosch. 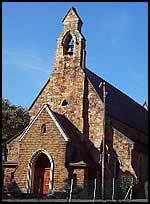 Just above the Main Road, opposite the famous Rondebosch Fountain, you will find the Anglican Parish Church of St Paul. It has served the community of Rondebosch for more than 180 years. The church receives no formal funding and depends on the generosity of its congregation and friends to maintain the fabric of the building and the graveyard, and to support its ministry in the area. Please feel free to visit us for a service or just to walk around the church and the graveyard. Click here for a list of the services for Holy Week and Easter 2019.
to be a united fellowship of diverse people dedicated to worshipping God and spreading the Gospel in the power and compassion of the Holy Spirit. We also have a Facebook Group - do join and push up the numbers. If you are looking for your ancestors in the Parish Registers, please contact the former rector, Fr Derek Pratt, whose hobby is genealogy and who is willing to help you. Go to Parish history – Property for more information on the graveyard and those buried there. For information on those buried at Black River Cemetery from 1926 to 1946 please click here. Click here for a copy of this week's pew leaflet (Adobe Reader required). Click here for Archbishop Thabo's blog site, where you can find his latest statements.